Mason Bees - In Stock for 2017! Mason Bee Cocoons are in stock for 2017! 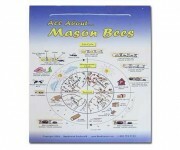 Check in with us about picking up your Mason Bees and Products. Includes 12 cocoons per package. The Spring Mason Bee Osmia lignaria, is a friendly early spring pollinator. It emerges when tree fruit blossoms and blueberry blossoms are open early and mid spring. Ready to hang in your garden! 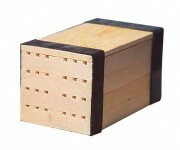 Suitable for Small Gardens, and new Mason Bee keepers. Our Starter Cottage is "move-in ready" for Mason Bees. Mount on the sunny side of a house or garden shed and bees will soon settle in. 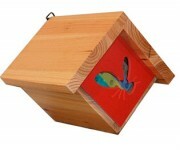 Modest in size and price, it’s a perfect first mason bee house, great in the classroom and an ideal gift for gardeners. panel protects bees from predating woodpeckers, mice and parasitic wasps. into fresh nesting straws in the spring. The Starter Cottage is durable, attractive, easy to clean, and made from sustainable resources to last many summers. Includes: Chalet wooden structure, trays with 30 tunnels, suitable for up to 30 females and 180 eggs, and predator guard. You can hang the Chalet, or mount it on a wall of a shed or building. Then watch these busy native pollinators at work in your yard or garden. An overhang at the mouth of the Chalet protects the bees from rain, wind and hot sun. for fall cleaning, and reinsert the cleaned trays ready for spring. 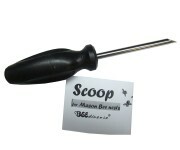 pop the trays apart, and gently slide out the cocoons with our Bee Scoop. The Chalet is durable, attractive, easy-to clean, and made from sustainable resources to last many summers. Materials: solid wood, corn material and plastic. 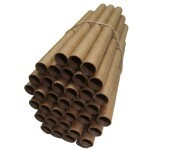 Cardboard nesting tubes are attractive to mason bees and are a good way of starting with and keeping Mason Bees. 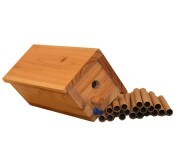 Nesting tubes are ready for spring mason bees that are looking for suitable nesting material. DIRECTIONS: Set tubes into a dark water-proof container to protect them from rain and direct sun. Fix container onto a sunny wall of a house or shed before spring blossoms are in bloom. When wild mason bees are in the vicinity they search for suitable nesting material such as cardboard nesting tube. The cardboard is 100% recyclable paper. Tubes are a one-time item. Once a mason bee uses the tube as a nest, dirt and parasites decreases the livability of the nesting tube. Unoccupied tubes are re-useable. tubes, gather, wash and store hibernating mason bee cocoons. 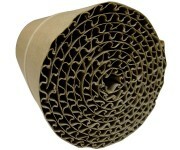 Corrugated wrap provides nesting cavities for the smaller summer mason bees. A good starting nest for summer bees. mason bees that frequent gardens from May to September. The trays have 24 tunnels, to accommodate up to 24 bees and 200 eggs. The trays slip easily into any BeeDiverse Mason Bee House. 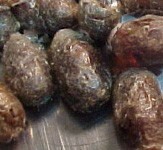 close up look at the nests and cocoons. Specifically designed to harvest cocoons from nesting trays. Designed and sized to gently and easily lift cocoons out of nesting trays. Safe handling of cocoons means you’ll have viable cocoons and more mason bees pollinating your garden the following spring. At the same time as harvesting cocoons the scoop scrapes out dirt and debris from nesting trays. This makes it much easier to clean the nests once the cocoons are removed. Completely revised and updated with over 50 illustrations and 56 new pages! Clear step-by-step instructions. A solid reference for experienced gardeners and beekeepers. A perfect companion for all BeeDiverse products. It brings a powerful combination of scientific research and practical experience to the challenges of pollination. This illustrated book is intended for anyone who wants to increase yields and blooms naturally – because a well-pollinated garden is a lush garden. 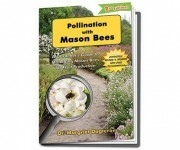 Author Dr. Margriet Dogterom has more than 20 years experience in apiculture – in both hands-on field work and scholarly research. She created the QuickLock System for Mason Bee houses – specifically designed according to the foraging and nesting behaviours of these bees. Margriet consults for commercial growers. A quick glance informs you – What to do and When to do it! This sturdy poster is an instant guide Hang this sturdy, one-page poster on your shed or workshop for instant reference all year around.